Only a month remains to apply for the 2013 NATS Intern Program, an exciting and innovative venture that seeks to pair experienced and recognized master teachers of voice with talented young members of NATS. Deadline for applications is Dec. 15, 2012. 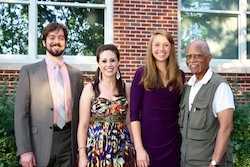 This year’s selected interns will work with master teachers Kenneth Bozeman, Karen Brunssen, Allen Henderson and Edrie Means Weekly at Vanderbilt University from June 12-20, 2013. Donald Simonson is director of this year’s NATS Intern Program, while Jonathan Retzlaff is the on-site coordinator. Within a format designed to promote the dynamic exchange of ideas and techniques, the goal is to improve substantially the studio teaching skills of the promising young teachers who participate. In 2012, more than 40 applications were received for 12 spots. Last year’s class included teachers who primarily teach in university settings as well as those whose focus is the independent studio.